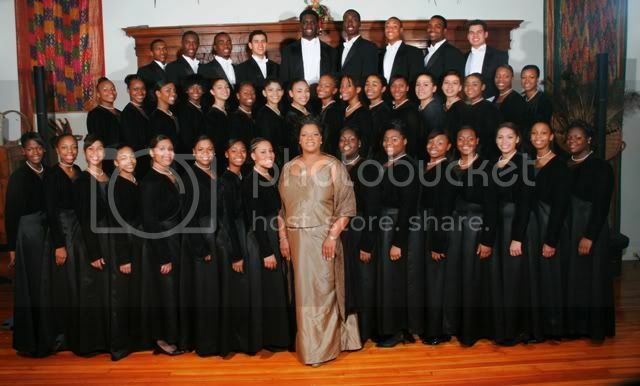 blackgivesback: Songs of Solomon: An Inspirational Ensemble, Inc. Songs of Solomon: An Inspirational Ensemble, Inc.
Chantel Renee Wright, a native of Chicago, is an award winning choral conductor with an impressive resume. Her career has taken her to Atlanta, where she served as a music educator for Dekalb County Public Schools, and to New York, as the Artistic Director of the Queens Symphony Orchestra Youth Gospel Choir, and the Director of the Girls Choir of Harlem. In 2001, Chantel branched out on her own to create Songs of Solomon: An Inspirational Ensemble, Inc. The Harlem, NY based non profit youth music ensemble offers a safe haven for youth ages 13-21 to help them build academic success and enhance social skills, while participating in civic activities and leadership development training. The ensemble tours nationally and internationally, and performs a challenging repertoire which consists of African American spirituals, anthems, traditional/contemporary gospel, and inspirational music, while simultaneously preserving the integrity of music reflective of the African Diaspora. They have also backed major performers, including, Ciara, Earth, Wind and Fire, Anita Baker, Aretha Franklin, Gladys Knight, Mary J. Blige, Kelly Clarkson, Fantasia, Ruben Studdard, Elton John and others. Currently, the ensemble is in Los Angeles to perform at a Legacy Event fundraiser to benefit the Tuskegee Airmen, Tomorrow's Aeronautical Museum (TAM) and Kimberly Anyadike, the youngest African-American female to pilot an airplane transcontinentally at age 15 in honor of the Tuskegee Airmen. The event will be held on Saturday, July 25th at the World War II aviation themed Proud Bird restaurant in Los Angeles, with Dr. Mae Jemison, NASA's first African American female astronaut, as the keynote speaker. Songs of Solomon is proud to be supporting the Tuskegee Airmen and TAM. The historical event will bring together mavericks, trailblazers, fellow youth and significant figures who help to globally educate and empower mankind. The event will raise funds for the Tuskegee Airmen Scholarship Fund and TAM, who sponsored the youth ensemble's 10-day trip. TAM provides aviation scholarships for young aspiring pilots and at-risk youth and has enabled five kids to set ten world records in aviation. TAM offers after-school educational programs, gang and drug intervention, life skills, a safe haven and many other activities designed as an alternative to self-destructive behaviors. Also, Songs of Solomon is looking forward to experiencing LA's cultural/film/music industry happenings beyond their prescheduled music conference itinerary. They have a wish-list during their LA visit that includes for an afternoon or evening worship service; attending television show tapings; visiting television/film/music studios; meeting Los Angeles area residents/civic leaders; singing at a special event; going to a red carpet, film premiere; and, enjoying a Dodgers game. If you would like to help make their LA trip a memorable one, or would like to book an appearance, contact Chuck Garrett at PUMP, cg[at]pumpny.org. Visit HERE to learn more about these talented youth.